I rarely write about new radio programs but this one piqued my interest. Not just because of it's host Manny Pacheco, but also because of it's format. 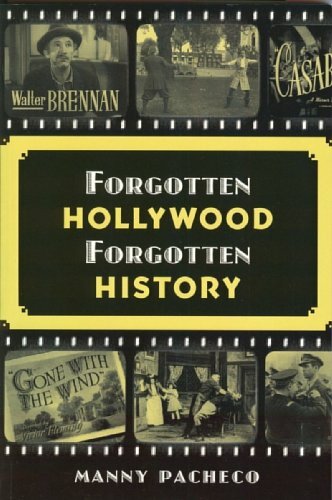 In 2009 Manny published a book called Forgotten Hollywood. The book is about the supporting casts instead of those with histories top billing. Basil Rathbone doesn't get enough press these days. That book led to this radio program. Manny Pacheco is one of those names that keeps turning up in LA Radio. He started at KRLA in 1980, then jumped to KDAY a year later and KNAC another year later then back to KRLA. He went from there to KKBT in 1985 and kept going. He spent time at KOCM, KIKF, KMGX and KGIL, before returning to KRLA briefly in 1993. More recently in the late 90s he spent time back at KIKF and KBIG. He did some fund raisers on Public television Channel 8 KCET-TV Then after a long, strange active period in the evil arts of karaoke, he returned to radio. Then two months ago came his new program on 1510 KSPA-AM. They currently airs nostalgia, a natural fit for a program mixing old standards and movie themes. But they only flipped back to Nostalgia at the end of last year. They spent June through December airing talk to no great success. The KSPA Website www.thesparadio.com clearly notes a simulcast on 1450 KFSD-AM, but other sources indicate that ended last year. That situation remains uncertain. It is my current understanding that the simulcast ended in March of 2010, but restarted in November of 2010 and continues today. regardless, 1510 KSPA-AM is airing "Forgotten Hollywood" Sundays at 3 PM playing music and audio clips from classic Hollywood movies. They will be having interviews with some of the related artists, directors and presumably those attention-loving mogul types. There is also a segment called "On The Backlot" which guests Gary Lycan. Lycan presently is a writes for the Orange Country Register. He's a total mystery to me, but I like his blog. Thanks Manny. It's fixed now.